"Products don't generally achieve cult status without some kind of miracle factor, and Alpha-H Liquid Gold definitely has it." For over 15 years, Liquid Gold has been the bridge between the beauty counter and invasive treatments. Liquid Laser is designed as an alternative to invasive skin treatments to address the challenges of 40+ skin. The Age Delay range is designed to reduce the appearance of ageing and prevent further signs of ageing. 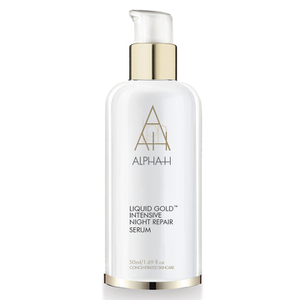 Considered a global leader in corrective and preventative skincare, Alpha-H creates revolutionary cosmeceutical fromulations which help bridge the gap between the beauty counter and invasive treatments. Despite a history stretching back over twenty years, the core message remains unchanged; Alpha-H is committed to achieving clinical results. Discover our cleansers and exfoliants that restore skin's natural pH balance, leaving it fresher, clearer and smoother. Shop our range of targeted treatments and correcting products such as our vitamin serums and masks. Give you skin a hydration boost with our collection of moisturisers that deliver moisture and other beneficial ingredients. This award-winning Australian skincare brand prides itself on being dedicated to professional skin care, boasting a range of products put together to soothe, nourish and effectively treat different skin types and concerns. Committed to delivering high-quality results of replenishment and rejuvenation, the company believes pushing the boundaries, sustainable skin care and honest price points are at the very heart of what makes their skin care products so special. With a range of facial treatments, serums, creams, as well as exfoliators and masks, Alpha-H is the one-stop shop when combating any skin-related problem.